An evolutionary ecologist at the University of Southampton, is using 'grains of sand' to understand more about the process of evolution. Dr Thomas Ezard is using the fossils of microscopic aquatic creatures called planktonic foraminifera, often less than a millimetre in size, which can be found in all of the world’s oceans. The remains of their shells now resemble grains of sand to the naked eye and date back hundreds of millions of years. A new paper by Dr Ezard, published today (9 August 2013) in the journal Methods in Ecology & Evolution, opens the debate on the best way to understand how new species come into existence (speciation). The debate concerns whether fossil records such as those of the planktonic foraminifera, contain useful evidence of speciation over and above the molecular study of evolution. Molecular evolution traditionally uses evidence from species that are alive today to determine what their ancestors may have looked like, whereas this new research promotes the importance of using fossil records in conjunction with the molecular models. 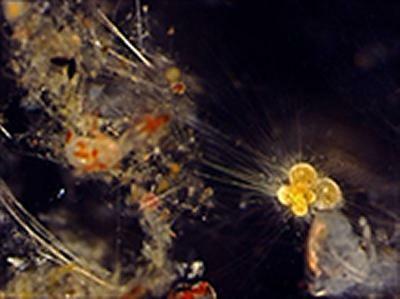 Dr Ezard, from Biological Sciences and the Institute for Life Sciences at Southampton, says: “Because planktonic foraminifera have been around for many millions of years and rocks containing groups of their species can be dated precisely, we can use their fossils to see evidence of how species evolve over time. We can also see how differences between individual members of species develop and, in theory, how a new species comes into existence. In the paper, Dr Ezard and colleagues, Dr Gavin Thomas from the University of Sheffield and Professor Andy Purvis from Imperial College London, highlight the importance of using fossil and molecular evidence to study evolution. Their intention is that the use of both types of data will become widespread in the future study of evolution. To support his research, Dr Ezard has received an Advanced Fellowship from the Natural Environment Research Council (NERC) to study how variation among individuals generates variation among species. He will conduct this interdisciplinary research in the Centre for Biological Sciences at the University, in close collaboration with researchers from Ocean and Earth Science at the National Oceanography Centre, Southampton. Watch a video of Dr Thomas Ezard discussing his research and his NERC fellowship here.